Chop ends of asparagus, peel them if they are white and cut them in small pieces. 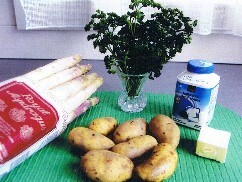 Place them in a deep pan and spread salt, sugar and butter. Secure lid tightly and cook for 8-10 min. Then pour in cream, parsley, season to taste and simmer for 5 more min. 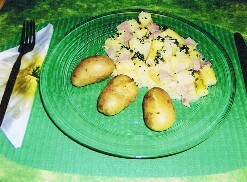 Eat with boiled potatoes and ham. This can be used as sauce for long pasta, such as Spaghetti or Linguini.